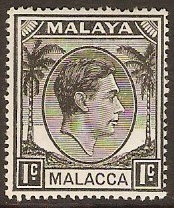 Malacca 1949 1c Black. SG3. Unmounted mint 1949 1c Black. SG3. 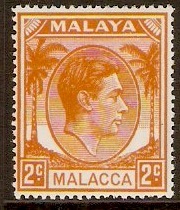 Malacca 1949 2c Orange. SG4. Unmounted mint 1949 2c Orange. SG4. 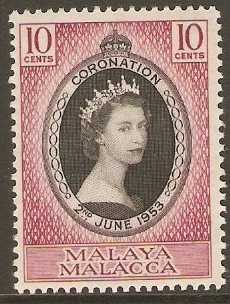 King George VI definitive stamp. 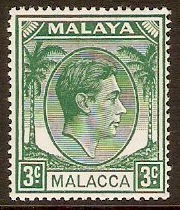 Malacca 1949 3c Green. SG5. Unmounted mint 1949 3c Green. SG5. King George VI definitive stamp. 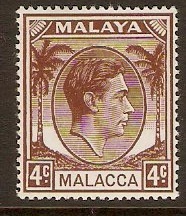 Malacca 1949 4c Brown. SG6. Unmounted mint 1949 4c Brown. SG6. King George VI definitive stamp. 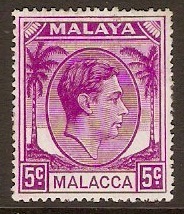 Malacca 1949 5c Bright purple. SG6a. Lightly mounted mint 1949 5c Bright purple. SG6a. King George VI definitive stamp. 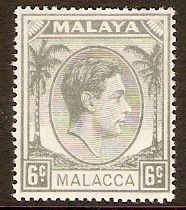 Malacca 1949 6c Grey. SG7. Very lightly mounted mint 1949 6c Grey. SG7. King George VI definitive stamp. 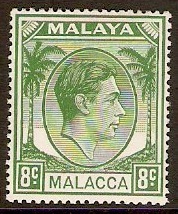 Malacca 1949 8c Green. SG8a. Mounted mint 1949 8c Green. SG8a. King George VI definitive stamp. 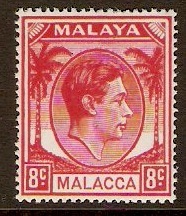 Malacca 1949 8c Scarlet. SG8. Unmounted mint 1949 8c Scarlet. SG8. King George VI definitive stamp. Malacca 1949 10c Magenta. SG9. Unmounted mint 1949 10c Magenta. SG9. King George VI definitive stamp. Malacca 1949 12c Scarlet. SG9a. Mounted mint 1949 12c Scarlet. SG9a. King George VI definitive stamp.